A New Port Richey father says that his 2-month-old baby was asleep in her crib on Friday afternoon when a tornado knocked a huge tree onto her nursery. 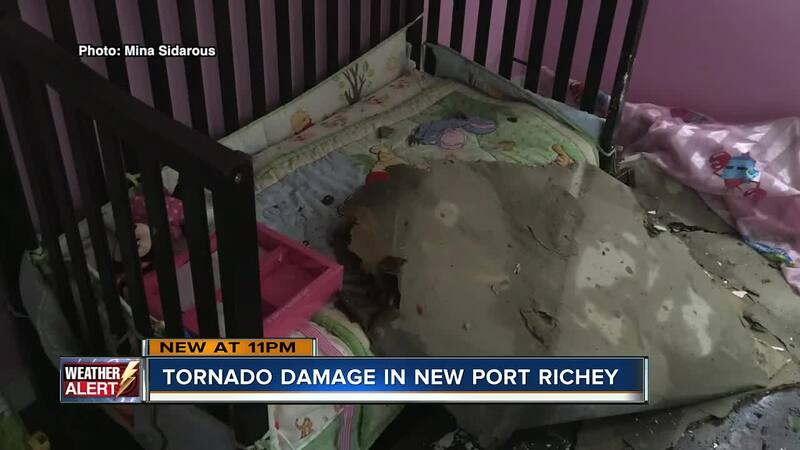 NEW PORT RICHEY, Fla. — A New Port Richey father says that his 2-month-old baby was asleep in her crib on Friday afternoon when a tornado knocked a huge tree onto her nursery. The Sidarous family says they’re astounded their youngest daughter is okay, after the large Oak tree toppled over onto the baby's room, causing the ceiling to crumble. A picture, taken by the baby's father, shows his daughter's crib with a large chunk of drywall crumbled on top. “I’m scared but the baby and my wife are okay. It’s scary," Mina Sidarous explained. Parts of the house tore off leaving patches without any roof at all. Sidarous says he’s blessed that both his wife and baby escaped their home on Player Drive — without a scratch. Now, the family is scrambling to find a new place to stay. “Trees fell onto the house and made a lot of damage,' Sidarous added. Right next door, Daniel Langheld’s parents are also okay after a tree fell onto their home. “My heart was definitely racing but when I got here and knew he was okay I felt better,” Langheld said. Both families are grateful to only be dealing with damage. “The ceiling looks like it’s going to cave in which it probably will but you just have to live with the damage,” he said with a sigh. Two different tornadoes tore through 19 homes in Pasco County, according to fire department leaders. Luckily, no injuries were reported in the county.